Bosnian-based comics publisher PrintMedia has announced plans to move into the UK market with a new comic magazine later in 2010. The title, which is still in development, will include new strips by creators such as PJ Holden (2000AD, Battlefields, Judge Dredd: The Megazine), Michael Pennick, John Ridgway, James Hudnall, Jon Rushby and former Marvel UK and Titan Magazine editor John Freeman, who will also be the title's UK editor. The magazine will feature a mix of action, science fiction and humour. The line-up of the title is still being finalized, but PrintMedia, which publishes three comics-related magazines including Strip Magazine and a localized edition of Metal Hurlant, plans to preview the magazine at the British International Comic Show in October. "I am really excited about this project," says publisher Ivo Milicevic. "There is no certain formula for success, but the Magazine will have some good stories and really great art, I can promise that. "I am hoping that we could fill the gap between 2000AD and superhero stuff," he added. "I grew up with the Steel Claw and The Spider, but as kid I also like Black Archer and Jet Ace Logan. Later, I was blown away with the work of Frank Hampson, Don Lawrence and Jim Holdaway. I never liked superhero stuff, but really appreciate old US newspaper strips and authors." Ivo has been working in publishing for 20 years. After college, he worked as journalist, and later as a publisher. Printmedia's business centres on print for the comic industry. Complementing the new magazine will be a series of UK comics albums. 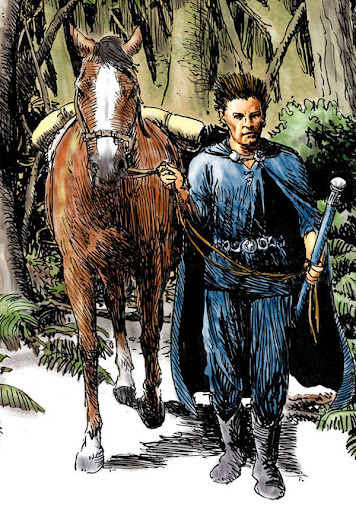 One title is already in development, a creator-owned steampunk adventure, Iron Moon, by Commando artist Keith Page, and PrintMedia has secured rights to James Hudnall and John Ridgway's fantasy tale Age of Heroes, which will be published in colour for the first time. • An English web site for the new title is in development. Visit PrintMedia's Bosnian website at: www.stripmagazin.com. All images © PrintMedia except art by John Ridgway. The winners of our Marvel Superheroes 4D competition, run in partnership with SciFiPulse.net, were Yvonne Clark from Bridgend and Andrew Dommett from Tividale, who each won a pair of tickets to the new exhibition at Madame Tussauds in London. Congratulations to them both who correctly told us Tony Stark was the name of the billionaire who is also the Marvel superhero, Iron Man. Two of the world's leading entertainment brands - Madame Tussauds and Marvel Entertainment - have joined forces to create a unique new visitor experience at the leading London attraction - MARVEL SUPERHEROES 4D. As we previously reported, the stunning Marvel Super Heroes 4D features a mix of 4D animation, interactive themed areas and startlingly realistic Madame Tussauds wax figures over three floors of the attraction, featuring characters such as the Hulk, Iron Man, Nick Fury, Spider-Man and many others. There's even a specially-shot film that forms part of the exhibition. Ace media magazine Tripwire is back with another info-packed issue! The Eagle Award-nominated British-American magazine about comics and genre culture returns this July bringing even more of the quality features you’d expect from their previous issues. Beneath an exclusive Futurama cover featuring everyone’s favorite robot Bender, they chat to Matt Groening and David X Cohen about plans for their new run of the animated sci fi series on Comedy Central, and go behind the scenes at the Henson Company. Movie fans are sure to enjoy an interview with veteran movie poster artist Drew Struzan, revealing all about his work on the most iconic movie images in the history of cinema and why he's decided to move on to do more personal work. The magazine also probes the special effects of megahit Iron Man 2 with SFX house Double Negative. Author Glen David Gold talks about his novels in an exclusive interview and fantasy grand master Michael Moorcock offers a glimpse into his early career and growing up in post-War London. Finally, there's comics: Dave McKean discusses three decades creating his own niche as an artist, illustrator and director; J. Michael Straczynski and Paul Cornell talk about their takes on Superman, Wonder Woman and Lex Luthor respectively; Mark Schultz discusses bringing his Xenozoic Tales back into print; and the magazine also covers the various anniversaries of Captain America and DC Comics and talk to Titmouse about their new magazine and book. Last, but by means least, there's a giant helping of original strips from some of the usual suspects like Roger Langridge and Kev Mullins. 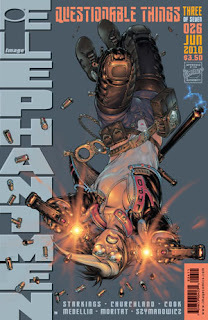 The latest issue of Elephantmen, written by former Marvel UK staffer Richard Starkings (whose career has simply spiraled upwards ever since) is now on sale, with art by Marian Churchland, Axel Medellin, Moritat & André Szymanowicz. 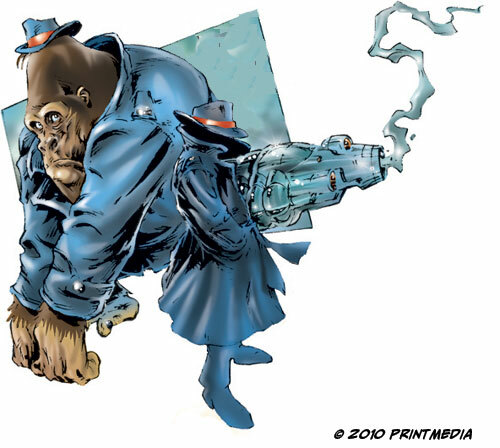 In Issue 26 - Questionable Things Part Three - Blackthorne is assigned to assist Hip and Ebony in tracking down the MAPPO agents loose in Los Angeles. Miki reluctantly agrees to help. Slovenia-based ThirdFrameStudios has just released Stripgenerator 1.6, the latest version of its hugely popular online software that enables users to easily create comic strips, share them with friends, rate, comment them and more. The new Stripgenerator brings many useful new features, including the ability to post your strips to social network sites, a gorgeous design and what the creators describe as "a vastly improved experience for the users". Stripgenerator, which was one of the first online comics creation tools I used and has been bought in adapted by a range of media companies including funnytimes.com and the Big Brother show - was great at inception. It's even better now and includes new theme packs with strip characters and items, community based creating strips on topic, better creation tools, detailed statistics for Stripgenerator artists and all-round improvements. The Book: The noodle soup called pho is the national dish of Vietnam. When Little Blue - having been dropped by a mysterious man with a red car and being told to count to 500 - finds himself in Ho Chi Minh City, Vietnam's baffling, daunting capital,his salvation is his own mobile pho stand. Little Blue's relationship with the city and its food brings an understanding to what it means to never want to return home and the fact that everyone goes away in the end. 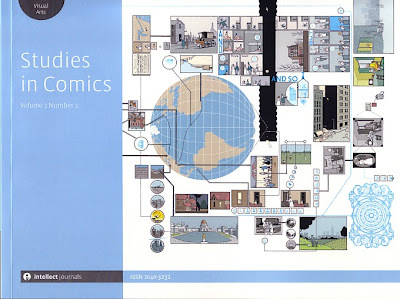 The Review: Comics fans should already be familiar with Julian Hanshaw, an animator, cartoonist and illustrator who won the Cape Observer Comica Graphic Short Story Prize in 2008 (the 2010 prize has just launched, details here on the ComICA site). 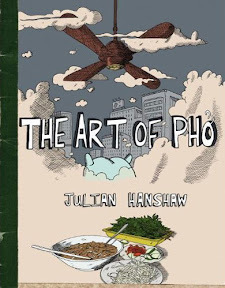 The Art of Pho is his first graphic novel, an eclectic, quirky love story of the strange entity Little Blue - an alien in a strange land, just like Hanshaw was when he visited Vietnam. The story - complete with Pho recipes, a pleasant bonus, comes across as a love story not just with Blue and some of the characters but Ho Chi Min city, too, which reflects Hanshaw's own links with the subject matter. Crammed with strange, bizarre images, weaving a peculiar and occasionally impenetrable tale of estrangement and romance, The Art of Pho won't be everyone's cup of tea. It's the kind of graphic novel Guardian reviewers and the literati will (and indeed, have) enthused about: working on levels beyond many action-adventure or humour titles that secure larger readership but are dismissed by the chattering classes as beneath their attention. This isn't to dismiss Hanshaw's work as some intellectual curiosity: there are some genuinely moving scenes in the story, as Blue's romantic nature clashes with the realities of the world he's plunged into. When, at one point, Blue finds himself a plaything rather than a person, having misinterpreted the attentions of a customer at his pho stand, there is plenty of resonance with the way relationships sometimes develop beyond the pages of this challenging graphic novel. Art-wise, crammed with the kind stunning imagery that earned Hanshaw his Short Story Prize for 'Sand Dunes and Sonic Boom' back in 2008 (published in the Observer Review), it's sure to capture the imaginations of many, but in terms of story, it perhaps needed to be a little less labyrinthine. • For those of you impressed by Hanshaw's thought-provoking art, there's an exhibition of some of the pages at the Arts... Exhibition Space and Bar in Camberwell, London until the end of the month - more details here on ArtSlant. Some of Julian's work is also on permanent display at the Pho Restaurant in Clerkenwell. "Something of an oddity... a ragbag of glorious art and either mixed-up or inconsequential narrative hamstrings what perhaps should have been an interesting, loosely linked art installation. Graphic yes – novel, not so much..."
Now in its fourth year, the Dundee Comics Day treads the fine line between the accessibility of a public lit fest, as it is part of the Dundee Literary Festival, and the sensibilities of an academic conference since it is located in Dundee university and run by academics. This year it hit the balance perfectly. Run by Dr Chris Murray of the University's Humanities department, each Comics Day has a theme and this year's was Creating Comics, from writing and illustrating, via editing and designing, through to publishing. As well as organising the Comics Day, Chris is co-editor, along with Julia Round of Bournemouth University, of the new academic journal Studies In Comics and free copies of the first issue of this 186 page, oversized A5, landscape magazine were available to those attendees who were interested. The first issue is also available free online from its publishers, Intellect Books. Those of us who have been to many of Chris' events in the past are aware of his line in sartorial elegance and this year he didn't disappoint with a day-glo green tie against a red shirt. The day began at 11am in the university's spacious and well equipped D'Arcy Thompson Lecture Theatre with a one hour workshop on drawing manga run by Manga Shakespeare artist Nana Li who went on to join the signing sessions later on in the afternoon. Dundee University runs a popular annual manga/anime convention called D-Con so it was surprising that this manga workshop wasn't better attended but then the Dundee Comics Day is normally a small, intimate affair and it would perhaps lose some of its friendliness if it had a much bigger turnout. As well as the friendliness, the other plus point for Dundee is that the cost for the entire day was £10, which included an ongoing supply of refreshments. While this is a fairly standard price for a single day at a comics convention, for a literary festival it is a bargain. The Edinburgh International Book Festival this year would charge £54 plus booking fees for five guest talks and an art workshop, with refreshments extra and the guests escorted to and from their talks leaving the only chance to talk to them being at any post talk signing sessions. Things are rather different in Dundee. The main afternoon session began with artist and designer Rian Hughes. While Rian has various comic strips to his credit, including Grant Morrison's Dare, 2000AD's Robo-Hunter and The Science Service by downthetubes' own John Freeman, he spends most of his time as a graphic designer so his talk had the potential to be perhaps the least interesting of the day. However as he took us through the type of work he does, including advertising posters for The Body Shop, point of sale illustrations for Clark's Shoes, designs for Swatch Watches, and a multitude of book illustrations including those for Geri Halliwell's children's books, his ability to articulate his design choices and his enthusiasm for what he does shone through and made for a very interesting talk. Marvelman and Excalibur artist Alan Davis was next with a heavily illustrated talk on how he creates a page of comic art from the initial thumb nail sketches, through pencilling and inking to the final coloured product. He explained how he saw some pages as being 'silent' despite them having text boxes and speech balloons because the artwork was enough to explain the story of the page, compared to those pages that needed the text for the reader to understand what was happening. As a superhero artist he explained why he believed in "swoosh" lines to indicate movement and how they could be incorporated without being overly distracting by drawing the character's anatomy around the movement lines. Since Alan chose to sit at the lecturers desk at the front of the large lecture theatre there was no distraction of him walking around as he presented page after page of his superb art to the rapt audience and I'm sure that I wasn't the only one with a pang of disappointment when he announced that he had reached his final page. Questions for Alan followed before a break during which there was a signing session in the Tower Building's reception area by Rian and Alan. Also in the reception area, along with sales tables from the local comics shop, Black Hole, and local comics merchandiser, Fine and Dandy, was an exhibition of the late Willie Richie's work. Sadly this DC Thomson artist, who was a great comics fan and collector, passed away earlier this year and the exhibition showed the range of his talent using original artwork from the DC Thomson archives. This ranged from his minimalist art for Baby Crockett to the rather more detailed art for Simple Spyman, both from Beezer, as well as covers for Sparky, designed to be coloured as part of the production process, and full colour pages from the nursery comic Bimbo. This free exhibition will remain open until 21 August 2010. After the refreshment and signing break, former DC Thomson editor Bill Graham gave a talk on Willie's work for DC Thomson concentrating on the work that both men had done for what Thomson's refer to as "Pony Stories", the comic strips they produce for the European Egmont comic Wendy. This explained one of the pages in the exhibition which no one seemed to recognise, a humorous horse strip called Snooty and Scamp. This was created for Wendy with Bill writing and Willie illustrating some 800 pages of the strip over the years which was then translated into German and Swedish amongst other languages. The exhibition, along with Bill's fond memories and amusing anecdotes, were a fitting tribute to his friend and colleague. The afternoon then continued with a talk from Dez Skinn. Writer, editor, manager, publisher, Dez has had such a varied career that the choice of what he was going to talk about had prompted some discussion between attendees earlier in the day. His decision to tell us the history of fan favourite magazine House Of Hammer was a popular choice with his animated and amusing talk covering artists as diverse as Brian Lewis, Dave Gibbons, Joe Colquhoun, Paul Neary and John Bolton as well as the early concepts for the magazine that we all refer to as HoH but which Dez had originally planned to call Chiller. Dez's recollections on HoH and his other work can also be read on his new website, dezskinn.com. The final talk of the day was from writer and editor Pat Mills. With a career spanning DC Thomson as well as IPC titles such as Battle, Action and 2000AD, Pat chose to focus on his French bande dessinee series Requiem: Chevalier Vampire. This series with Giger-esque painted art by Olivier Ledroit has reached nine albums in France along with four albums of the spin-off series Claudia: Chevalier Vampire with art by Franck Tacito. The first two Requiem albums have just been released in English by Panini as Requiem: Vampire Knight and Pat took the audience through the creation of the albums and his relationship with its foreign artist. He also emphasised the point that British creators should not just be looking to America to get their work published but to France as well. In addition to allowing creators to retain the rights to their work, French publishers deal with a considerably greater range of titles and styles as well as a much greater volume of published copies. He pointed out that sales in the French language of the first album of Requiem alone were in the region of 100,000 which, while an order of magnitude less than say a Jean Van Hamme title, is easily an order of magnitude more than any UK graphic novel print run. Pat's interesting and thoughtful talk left more than one creator in the audience with the realisation that they should be looking across the Channel as well as the Atlantic with their work. The day closed with a popular signing session in the reception area from Pat, Dez and Nana. One of the strengths of Dundee is the friendly atmosphere that exists outside the main lecture theatre with sales tables, exhibitions and refreshments all in the same area and the willingness of the guests to stand and chat to the attendees as well as to sign items outside of the slightly more formal signing sessions. Indeed where else could you talk to the editor of Warlord having just spoken to the editor of Battle or, as below, see the current Tharg's newest artdroid, Graeme Neil Reid, share a joke with the original Tharg, Pat Mills. 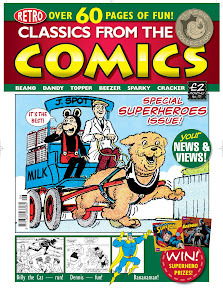 Fans of older British comics who despair at the dearth of titles on newsagents shelves compared to what there used to be for readers any older than junior primary, or who find the obsession that much of British comics fandom has with imported American superhero product strange, especially given its minuscule UK sales, have long found that mainstream UK comics conventions do not cater for them. These fans are as interested in what has gone before as in what they can get now and they have often bemoaned the fact that there are no "old comics" conventions. This year's Dundee Comics Day was as close to an "old comics" convention that I have come across, yet with a selection of creators with such impressively diverse careers that any mainstream comics convention would have been proud to have had them on their guest list. The Dundee Comics Day has been the highlight of my comics year so far and I look forward in anticipation to what Chris Murray and his team have in store for next year. The Dundee Courier newspaper covered the Dundee Comics Day here. (via Al Davison): A quick reminder that the first collection of IDW's Doctor Who ongoing series, written by Tony Lee, is out, featuring Al Davison's art on the Silver Scream arc (coloured by Lovern Kindzierski). The second arc is drawn by Matthew Dow Smith and coloured by Charlie Kirchoff. Unlike the regular comics, which are technically not available in the UK due to licensing restrictions, Doctor Who: Volume 1 - Fugitive appears to be available and on sale in comic stores and online. Al also reports the IDW Doctor Who Annual 2010 will be out soon, and features a story written and drawn by him, along with contributions from Tony Lee, Matthew Dow Smith, Jonathan L Davis, Kelly Yates, Phil Elliot, Charlie Kirchoff, Neil Uyetake and Robbie Robbins. Away from Doctor Who, the Trade Paperback edition of Al's Hokusai Demons, a full-colour collection of dream comics with a Japanese theme, is due out in August, introduced by Neil Gaiman. DC Comics fourth House of Mystery collected Trade Paperback is also out now, written by Matthew Sturges and featuring a ten-page story drawn by Al, coloured by Lee Loughbridge and lettered by Todd Klein. Other creators in The Beauty of Decay include Bill Willingham, Luca Rossi, Mike Kaluta, Richard Corben and plenty more. ... and it really is a classic of a comic, with a huge variety of strips from several decades - including some rarely seen examples of picture and text stories from the huge DC Thomson comics archive. The trumpeted 'superhero' theme - which includes a competition to win Batman and Superman audio discs - doesn't extend to every strip featured in this issue of Classics from the Comics, and in the case of 'Jack Flash, The Flying Boy', published in The Beano in 1949, even editor Garry Fraser admits the superhero description is slightly nebulous. But that said the selection is again full of gems, with an increased number of adventure strips, including 'Billy the Cat' and the 'The Danger Man' from 1959 and a 1944 episode of 'Mr X'. The inclusion of 'Mr X' from the second world war years indicates that superhero-styled characters, perhaps inspired by US comics such as Superman, were clearly quick to percolate into British comics, perhaps sooner than some fans realize. There's good news, too, for fans of DC Thomson material who wanted to see creator credits in this 'retro' title - Gary responded to our suggestion in our last review and has begun including some artist details. Classics from the Comics increasingly seems to be adopting a format combining both adventure and humour strips long popular in British comics but dropped by modern publishers in favour of more focused titles that favour adventure or humour, but rarely both. It's simply a delight - a reprint package that works, in spades, and deserving of your measly £2 to try it out. • More about Pinkerton's Colours on Wikipedia, in case you were wondering, too! 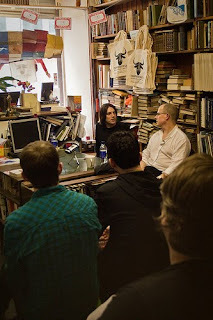 As part of the West Port Book Festival on Friday 25 June 2010, David Bishop interviewed artist Frank Quitely at Edinburgh Books second hand bookshop in Edinburgh's West Port. Since the event was always going to have a small audience due to the size of the venue, the interview was recorded and has now been made available as a podcast on the Festival's website. The talk lasts just over 50 minutes during which time the two men discuss the artist's work both for UK comics, including his work for 2000AD when Bishop was Tharg, and for the American comics that he is now better known for. In addition to the podcast the website links through to photos of the event taken by Chris Scott, one of which we have borrowed, which show that Edinburgh Books looks very much like the public's perception of what a traditional second-hand bookshop should look like with Bishop and Quitely surrounded by bookcases stuffed full of large, old books. For those who could not make the West Port event, both Frank Quitely and David Bishop will be appearing again in Edinburgh at the Oxfam Comic Event on Saturday 17 July 2010. The podcast is available on the West Port Book Festival website. The photos of the event are on Chris Scott 's Flickr account. Tube Surfing: Warren Ellis, the Bulletproof Coffin and the Galaxy's Greatest Covers! The trailer for the movie adaptation of Warren Ellis-scripted graphic novel Red (art by Cully Hamner) is online to view now. Ellis wrote some interesting notes about the adaptation back on his blog in December of 2009. Well worth a read. 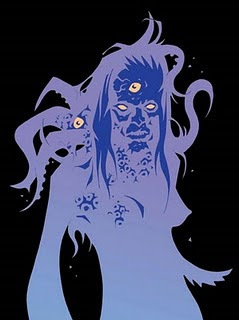 Artist Shane Oakley (Albion, Channel Evil) shares his thoughts on life, the universe and comics over at horror comics 'zine From the Tomb. At the Forbidden Planet International blog, Richard Bruton draws our attention to free music magazine, Stool Pigeon. The latest issue contains lots of cool looking comics and also features an interview with Alan Moore. Good stuff! And finally, have I given a plug to 2000AD Covers Uncovered yet? If not, I should have. It's a blog devoted to, in their own words, '...showcasing artists' covers for 2000AD in all their glory'. But actually, it does much, much more, providing some great analysis and commentary on said covers. Go and have a look. The lucky winners of our Rude Britannia book competition - marking the launch of the Rude Britannia Exhibition at Tate Britain in London - were Chris Williams from Liverpool; Paul B. Rainey, from Milton Keynes; and David Humphreys from Crawley. Congratulations to the winners and commiserations to our many entrants, all of whom correctly nited that Steve Bell's If appears in The Guardian. 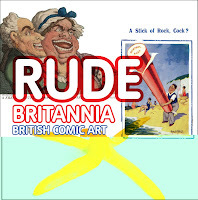 Rude Britannia: British Comic Art by Martin Myrone, Tim Batchelor and Cedar Lewisohn can be purchased from the Tate Britain shop for the exhibition price of £17.99 until 5th September 2010. This 160 page, entertaining and irreverent history - featuring 100 colour illustrations - aims to present a wide-screen vision of comic art, from the eighteenth century to the present day, it features works by classic cartoonists and caricaturists, from Gillray, Rowlandson and Cruikshank, to Steve Bell, Robert Crumb, David Low and Ronald Searle. Beginning with the origins of the caricature, the book encompasses cartoons, comic books, film, photography, audio, new media and contemporary art. It traces the development of different genres and techniques, and deals with the development of successive media, from the engraving through to the newspaper and the online blog. 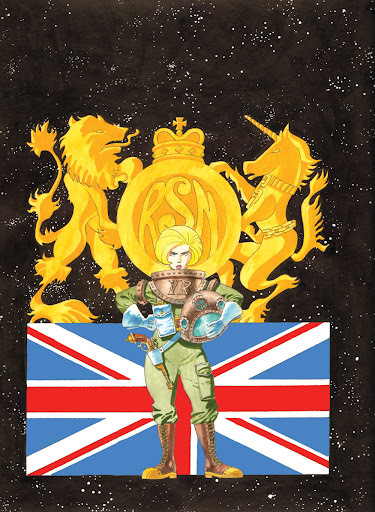 Through extensive illustrations of classic and little-known facets of comic art, the book succeeds in telling an alternative history of Britain. Leading critics are joined by well-known comedians, cartoonists and historians, making this a very contemporary take on what is still a rich and vibrant seam in the public life of the nation. • Rude Britannia runs until 5th September at Tate Britain is at Millbank, London SW1P 4RG. Tel: 020 7887 8888 E-mail: visiting.britain@tate.org.uk. Web: www.tate.org.uk/britain/. Entry is free except for major exhibitions: Entrance to Rude Britannia is £10, Concessions £6. Open every day 10.00–18.00. The new issue of Spaceship Away, the science fiction comics magazine inspired by and featuring the original Dan Dare, includes some stunning exclusives sure to appeal to fans of the original version of the Eagle space hero created by Frank Hampson. 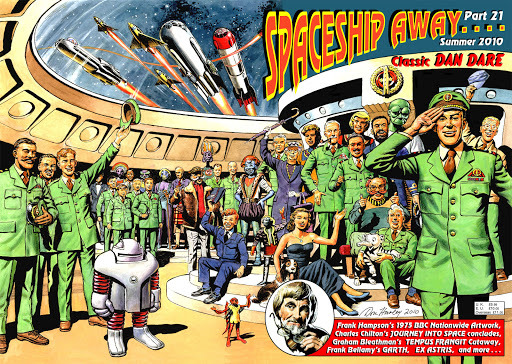 Wrapped in a glorious new Dan Dare cover featuring ever major character from the strip from veteran artist Don Harley (click on the image above or here for a larger version), the issue also includes a glorious tribute to Keith Watson's work on Dare by Chris Weston, as part of a retrospective of the artist's contribution to the legend. Garth: The Bubble Man - superbly coloured by John Ridgway - continues and, while there are two Dan Dare strips to enjoy this issue, proves the highlight of this issue's strip content for me, along with a cutaway of the Tempus Frangit vessel by Graham Bleathman. In something of a coup for the magazine, this issue carries coverage of a little known news piece about the making of Dan Dare made by the BBC in the 1950s, complete with photographs of the event, and also features some incredibly rare Dan Dare art by Frank Hampson created for the BBC Nationwide magazine show in 1975. The latest issue of Eagle Times, Volume 23 Number 2, Summer 2010, is on sale now from the Eagle Society, with highlights that include a photo-illustrated report on the Society's April 2010 gathering 'to celebrate Eagle's 60th Anniversary in Southport and a look at the ways in which alien languages were treated in the Eagle's 'Dan Dare' saga. 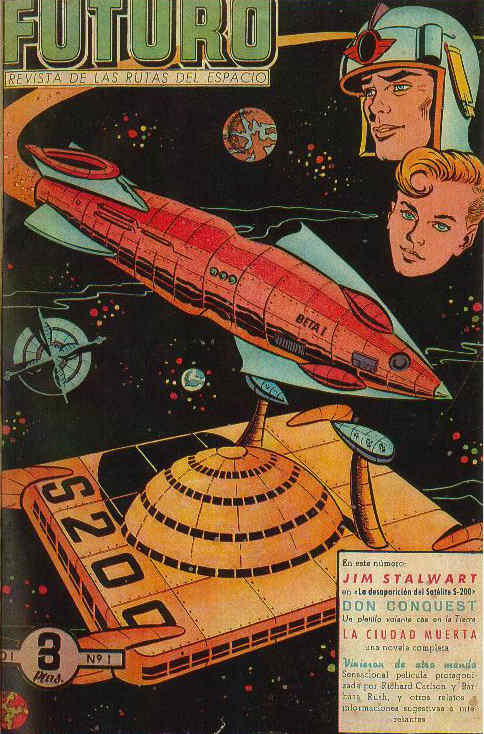 Also included are features on Space Captain Jim Stalwart by downthetubes contributor Jeremy Briggs - story synopses and foreign reprints, including in Spain's Futuro, of this 'forgotten' strip from 1954 drawn by Dan Dare artist Bruce Cornwell for Junior Mirror, a look at some of artist Ron Embleton's lesser known work, a review of some of the 'Authentic Plastic Assembly Kits' made by Eagle/Wall Plastics Ltd in the 1950s, plus recollections of the origins and activities of the Astral Group 'Dan Dare' Club in the 1970s. 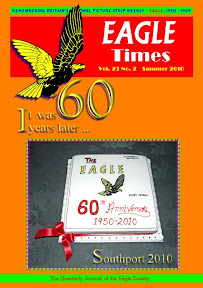 The cover illustration for Eagle Times shows the celebratory Birthday Cake which was cut and consumed by members of the Eagle Society at the Southport event on 14th April 2010 - the 60th Anniversary of Eagle's first publication.